Wireless Bluetooth streams audio for 10 hours to keep you rocking from a morning gym session all the way through a full day’s work. 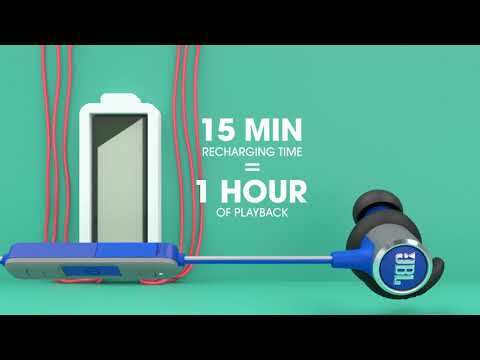 Quickly recharge the battery in 15 minutes for an hour of playback time. Featherweight, durable aluminum construction for long lasting comfort in all of your athletic or everyday activities. Flexible silicone ear tips and patented Freebit™ enhancers that both come in 3 different sizes allow for ultimate customization by mix and matching sizes to find the perfect fit and audio performance. Designed for Movement. Defined by You. Introducing a wireless headphone designed to match your love for sport with your active lifestyle. The JBL Reflect Mini 2 fits every ear shape and size with ergonomic silicone tips and patented Freebit™ enhancers, available in 3 sizes for customized comfort. Its sweatproof, lightweight aluminum design is stylish and feels effortless, while a 3-button remote and mic keeps music and calls conveniently close at hand. Its reflective cable keeps you more visible during nighttime routines. And with 10 hours of battery life powering signature JBL sound, you can keep moving without ever missing a beat. With the touch of a button you can conveniently manage your calls and access the voice assistant. JBL REFLECT MINI 2 is rated 3.9 out of 5 by 66. Rated 5 out of 5 by Lena777 from Ear buds stay perfectly in place I was looking for Bluetooth headphones under £100 that looked like they would stay put when training, specifically when running. These are great value and stay put when I’m exercising, they literally do not move which is perfect! Rated 5 out of 5 by Runner19 from Great I bought these to use when running and the are perfect. Rated 5 out of 5 by Jeff Devoe from Great sounding, minimal, rugged BT earbuds. A couple years ago I had purchased my first set of JBL Mini Reflect 2’s. I used them on runs/gym, traveling, online meetings for work. they’re so versatile, plus they actually sound good. I have been mixing and mastering electronic music for well over a decade, so sound quality is very important to me. It literally hurts my soul to hear sound that is not reproduced correctly. I couldn’t use these if they didn’t sound great! Long story...shortened...I ended up losing them and accidentally was sent the mini reflect 1’s from a company I ordered from on Amazon. I gotta say you guys made some major improvements with the 2’s. Anyway, I’m back on the 2’s and happy again. Thanks for making a great product! Rated 5 out of 5 by otis73 from So far so good...great sound quality...blocks ambient noise from gym...wouldn't expect anything less from jbl! Rated 5 out of 5 by Nick A from Sound / fit is good! I use the headphones when working out and they stay in great, and the sound is really crisp and clear. Hello!&nbsp;The Reflect Mini BT utilizes the standard Bluetooth Stereo Audio drivers available in most laptops. There are two different Bluetooth protocols, one for Headset Audio used for talking on the telephone, and the other for high quality stereo audio listening. Being that the REFLECT MINI BT is a speaker, your computer must connect to it using the Stereo Audio protocol. Your best bet is to go into your control panel and find the Bluetooth setup. This setup usually provides a setup wizard and will take you through the steps to install the drivers needed for Stereo Audio. how long is the talk time? Hi! The JBL Reflect Mini 2 features up to 10 hours of play time so you should receive up to 10 hours of talk time as well. However, volume level can effect the battery life so it is possible that you may receive less. I cant pair both of my wireless JBL headphones to my apple laptop. And I have JBL reflect mini 2 and Everest 110 and both of the will not connect why is that ?